What can we say? 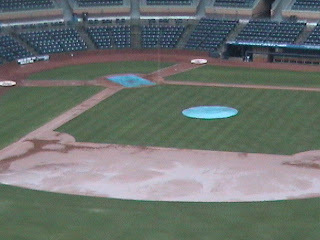 This is what the field looked like yesterday evening. If the game had been a home game, it would not have been a game. Things were a bit stormy down here while the Bulls were in Columbus. Not much to say about the game except that we finally scored a run, that Carlos Santana really likes Bulls pitching, and that once again we outhit our opponent and lost. But that’s baseball. Last night down in the jukebox by the bay in St. Petersburg, Florida, the Rays were playing the Cleveland Indians, the Clippers parent club. The new guy on the Rays team, Hank Blalock (remember Hank) hit a grounder to shortstop Asdrubal Cabrera. Cabrera managed to break his arm on the play. Shortly thereafter, up in Columbus, Clipper second baseman Jason Donald is told that he’s been called up. Not sure what it all means. Odd sort of vibe to the events. Clipper pitcher Mike Gosling took the occasion of pitching six shutout innings to announce his retirement from baseball. Pretty decent eight year career, mostly in AAA (stats). Bulls are off to Toledo, which may or may not be recovering from a made-for-TV visit by Crystal Bowersox. Who’s Crystal Bowersox you may ask? All I can say is that if you don’t know, you may be better off for it. I was watching the Rays game last night and after countless replays I still don't understand how Cabrera broke his arm on that play. If anything, I would have thought the second baseman would have been the one hurt. According to the article in the link above, "Cabrera was right of the second-base bag and Peralta was at the shortstop position", so Cabrera was for some reason, playing 2nd base at the time. Definitly a quirky series of events for all involved. What I understand is that they had a "shift" on for left hand batting Blalock. Shortstop was over to first base side of second, second baseman in the middle, first baseman on the line, and only the third baseman (Peralta) near the usual shortstop position. At least that the way I heard it. DRR apparently saw it so maybe he can chime in. If you click the link you put in the post you can watch the video there. There isn't a good view, and the two players get tangled. However, every time I watched it and I thought I saw an arm get bend or something that I thought was the injury I would realize it was an arm from the player that didn't get hurt. I'd looked everywhere but the very link I'd put up. 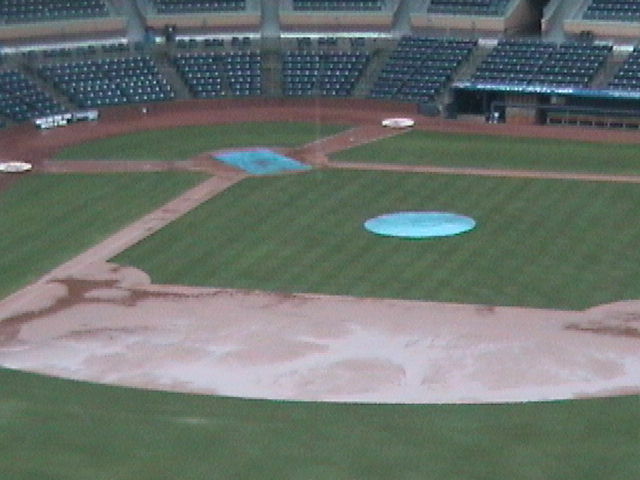 And, if you pause the video immediately you can see the shifted infield. I agree with DRR, it doesn't look like that hard a hit. But you've got bizarre dynamics going on in situations like that. what about wednesday's game did they lose again? Actually Wednesday morning, and yep, lost again, 5-2. Can't find anything to say about the two games, yet. Summary over at Bulls website seems to say it all. Wasn't able to listen to games, so might have been something interesting other than Hellickson taking his second loss. The most interesting thing yesterday was why Charlie got tossed. In the 3rd when it was 1-0 Mudhens, we had 1st and 2nd with no one out. Jennings was at the plate, bunted and missed the first pitch. The catcher threw behind the runner at 2nd, not in time. But the ump ruled that Jennings had intentionally interfered with the throw and called him out. Neil said it was an awful call and Charlie doesn't usually lose his cool, so I'd have to believe it. We ended up scoring one on a bases loaded walk to Ruggiano, but that inning hurt. Knew that Charlie had gotten tossed, but didn't see why (or just missed it). Agree that Neil is usually even-minded in his calls. Another oddity that I just noticed is that they were working with a 4-man crew. Don't think we've seen that this year. Wonder why?